Ad in Billboard Benelux Magazine in 1979 to celebrate the 1 million sales of "The Greatest Lover"
1976: Formation of Luv' (featuring José van de Wijdeven, Patty Brard and Marga Scheide). 1977: My Man (first single) peaked at #12 in the Netherlands and #10 in Flanders (Belgium). The second single (Dream, Dream) flopped. 1978: U.O.Me was a Top 3 hit in Holland and Belgium. 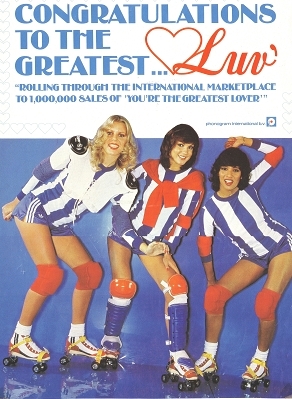 The follow-up single (You're the Greatest Lover) was the group's international breakthrough. This million seller was a #1 hit in Benelux, Germany, Switzerland and Denmark, peaked at #2 in Austria , #15 in South Africa and #37 in France. Not long after, Trojan Horse had the same glorious fate: it reached indeed the number one spot in Benelux, Denmark and Poland, peaked at #2 in Switzerland and Austria, #3 in Germany, #17 in South Africa and # 36 in France. The first album, With Luv', was released and a big selling record in Benelux, Austria and Denmark. 1979: The singles Casanova, Eeny Meeny Miny Moe and Ooh, Yes I Do maintained Luv's position as a popular group in the above mentioned countries . The studio albums Lots of Luv' and True Luv' were successful in the charts. Si, que Si (the spanish version of Ooh,Yes I Do) was a #1 hit in Mexico. The girls received that year the Conamus Export Prize for being the best Dutch Export act. 1980: Success of the singles Ann-Maria, One More Little Kissie and My Number One and the album Forever Yours. In the summer, Patty left the group and was replaced by Ria Thielsch. 1985: Story (a Dutch celebrity gossip magazine) brought the original trio together for a photo session, an interview and to grace its cover. 1988: The original members reunited for a Dutch TV charity show (Samen). 1989: Marga formed a new Luv' act with two new girls: Michelle Gold and Diana van Berlo. This version of the group only scored a moderate hit (Welcome To My Party, #22 in the Netherlands and #28 in Flanders). 1990: Michelle left Luv' and was replaced by Carina Lemoine. Although chart success was a distant memory, the ladies toured the clubs circuit and performed on TV. 1991: Luv' entertained the Dutch troops based in Dubai and involved in the Gulf War. 1993: The original Luv' girls (Patty, José and Marga) got together. A compilation (Luv' Gold) was released and topped the charts (peaking at #14) . A megamix single also came out and reached the 23rd position. The ladies were filmed in the British Virgin Island for a TV special on the Veronica channel. 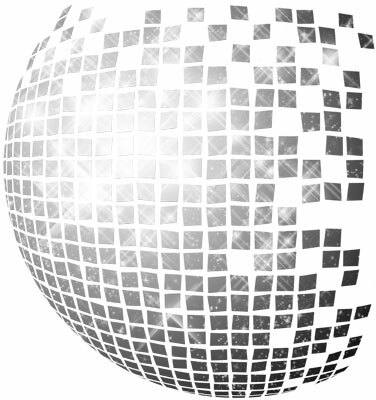 They went on tour in clubs and discos through Benelux, Germany and Denmark. 1994: Luv's last studio album (All You Need Is Luv') was released and only available in Kruidvat (a chain of drugstores). 1994-1996: The singers made some live shows and disbanded in late 1996. 2003: Thanks to the group's fanclub, Universal Music released a double CD compilation (25 Jaar Na Waldolala) to celebrate Luv's 25th anniversary. This anthology featured smash hits, album songs and bonus tracks. 2005: Luv' made a surprise performance at the 60th birthday party of Hans van Hemert (the producer who conceived the girl group). 2006: The girls reunited once again. A TV docusoap (Back In Luv) about their comeback was broadcast by RTL 5 in Holland and by VTM in Flanders. A DVD (also entitled Back In Luv) with TV archives from the trio's heyday came out. With the help from the official fanclub, Universal Music released Completely In Luv', a 4 CD Box (including their entire repertoire from the 1977-1980 period with bonus tracks and remixes). The Luv' divas were the guests stars of three mega shows of De Toppers (a supergroup featuring Gerard Joling, Gordon and René Froger who are very popular in the Netherlands) at the Amsterdam ArenA. 2006-2008: In addition to TV performances, Luv' was booked for discos, festivals, private parties and corporate events.